…or Gufic Biosciences Ltd. and Estee Lauder. I remember reading about the case of an Indian manufacturer of a herbal based stretch mark cream a couple of years ago. Since 1998, Gufic Biosciences Ltd. had been using the name SkinCliniq Stretch Nil for their popular lotion and when Estee Lauder brought their brand Clinique into the country some years later… Lauder were unimpressed by the brand’s use of the word “Cliniq”. Lauder brought a succesful injunction against the Indian brand in 2008 which prevented Gufic from using the word Cliniq while selling its products. Last month, Gufic Biosciences Ltd. won its legal battle against the cosmetic giant. 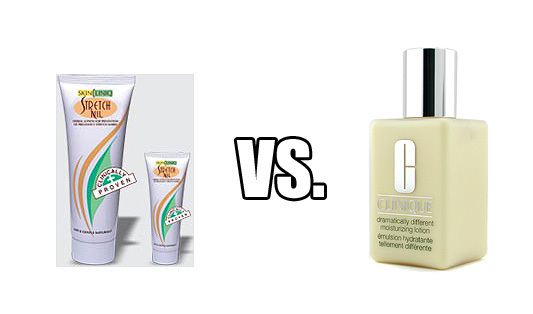 The judge ruled that Gufic’s use of the world ‘Cliniq’ in its product is not identical or deceptive to Estee Lauder’s ‘Clinique’. It was also noted that the major price difference between the two brands ensures no potential for confused consumers when shopping. Gufic’s SkinCliniq Stretch Nil retails at around $5 for 100ml of product. Hardly high-end pricing. And perhaps even more importantly… Estee Lauder didn’t even enter Clinique into the Indian market until 2007. Nearly 10 years after Gufic Biosciences Ltd. began selling SkinCliniq Stretch Nil. I do love it when a bit of good old-fashioned common sense reigns supreme. I love when the little guy wins. Some of these big companies just lock up legal battles for years and years and it’s quite silly. It’s about time when a small company wins stuff like this! Common sense exactly. This made me laugh. Warms you heart doesn’t it! Something massively gratifying about this. Unfortunately, for every one of these positive stories there are 200 others where the bulging corporate muscle squishes the little guy like a fly. This is what is so brilliant about the blogging community right now, 10 years ago no-one would have been able to publish a story like this for fear of ad funding withdrawal reprisals. Oh definitely… this success is a drop in the ocean. But completely gratifying as you say! It’s just really bad business to act like that and big brands don’t seem to realize that they’re going to get outed for doing it now that there is a real-time news source – blogs! Seriously, EL (even though I love some of your stuff) – do you have to be a bully?! Thank god for that, I would’ve headdesked if Estee Lauder had won. Big bullies.